I've been a long time user of body pillows to help me sleep and relieve back pain. I had no idea that an entire therapy had been developed around them, but it makes perfect sense to me. I've tried Body Pillow Therapy for the past week and have to say, it's been wonderful for my muscles, my sleep and my posture. Working long hours in front of the computer kills my lower back. This pillow has given me so much comfort that I wanted to share my experience, in case it helps others. What is Body Pillow Therapy? 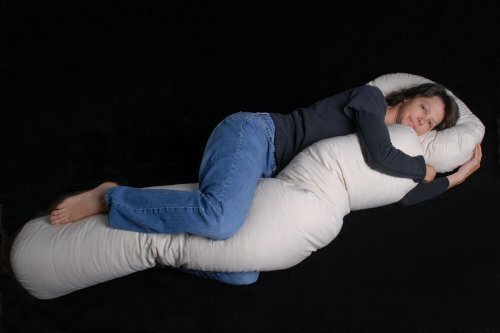 The people who created this pillow believed their was a need for safe, non-invasive forms of relief in the healthcare realm and I agree. Their product strives to help people achieve and maintain optimal structural health, relaxation and rest. My Body Pillow arrived in the mail fairly quickly. Unpacked, it's 5' 6" long, filled with 100% natural kapok fiber. I also received a white cotton cover with a side zipper to put over the pillow. Because of its special fiber, the pillow is able to support you in a variety of positions. It's easy to maneuver to the type of support you need. As a testament to this pillow, it's sometimes used in physical therapy sessions for special positioning to relieve joint pressure, manage circulation to injured areas, and support restorative rest. They've found there is often less need for pharmaceutical sleep aids and pain relievers this way. Check out the Body Pillow Therapy site for more detail regarding proper pillow positions. Looking to Purchase Body Pillow Therapy for yourself? Click here. Disclaimer: As always, our posts are our own, honest opinions and may differ from yours. We received a Body Pillow as part of our post. No monetary compensation was given.